It should be noted that these are by far the best cupcakes I've ever made. And quite possibly the best cupcakes I've ever eaten. I can't even believe how well they turned out! I made them for my birthday party (yes, my life is so sad that I have to make my own birthday cupcakes) and they were a total hit. I really think the difference was made because I actually followed all the instructions. I creamed the butter and sugar until they were a lovely consistency, almost like whipped cream. I actually brought the eggs to room temperature (yeah, I never do that). The cake ended up being super light and soft, while still moist enough to hold itself together. And it was my first attempt at swiss meringue butter cream, and it totally did not disappoint (even if I scalded myself a few times on my makeshift homemade double boiler). I didn't add any tequila (because, um, I don't drink tequila...) and they were still delicious. 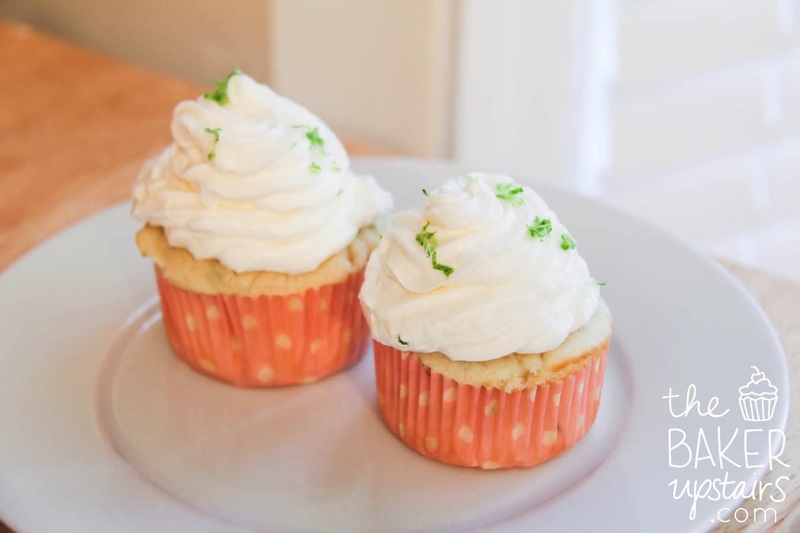 To make the cupcakes, preheat the oven to 325˚ F. Line two cupcake pans with paper liners. In a medium bowl, combine the flour, baking powder and salt; stir with a fork to blend. In the bowl of a stand mixer fitted with the paddle attachment, cream together the butter and sugar on medium-high speed until light and fluffy, 3-5 minutes. Blend in the eggs one at a time, mixing well after each addition and scraping down the sides of the bowl as needed. Beat in the lime zest, lime juice and vanilla. With the mixer on low speed, mix in the dry ingredients in three additions alternating with the buttermilk, beginning and ending with the dry ingredients. Beat each addition just until incorporated. Divide the batter between the prepared cupcake liners, filling each about ¾ full. Bake 20-24 minutes, or until a toothpick inserted in the center comes out clean. Let cool in the pan 5-10 minutes, then transfer to a wire rack to cool completely. To make the frosting, combine the sugar, egg whites, and salt in a heatproof bowl set over a pot of simmering water. Heat, whisking frequently, until the mixture reaches 160° F and the sugar has dissolved. Transfer the mixture to the bowl of a stand mixer fitted with the whisk attachment. Beat on medium-high speed until stiff peaks form and the mixture has cooled to room temperature, about 8 minutes. Reduce the speed to medium and add the butter, 2 tablespoons at a time, adding more once each addition has been incorporated. If the frosting looks soupy or curdled, continue to beat on medium-high speed until thick and smooth again, about 3-5 minutes more (don’t worry, it will come together, though it may take a very long time!) Stir in the lime juice and mix until fully incorporated and smooth.